You should have a domicile of Balochistan region or FATA region. If you do not possess the domicile of these regions then you cannot apply in this HEC scholarship program. To be in your masters level studies, you should have completed your 14 years of education. You should have 50% marks in your last degree program. If you want to complete your MS studies or your Mphil studies then you should complete your 16 years of education. In your last degree, you should have 60% marks. Age limit is 30 years and this is the maximum age limit for this program. You should have mentioned and required academic and educational qualification to be the part of this excellent and wonderful opportunity. This HEC scholarship program will be covering your Rs 60,000 fees and tuition dues on a per semester basis. You will get the living allowance of the amount of Rs 8000 on a per month basis. Then you shall get books allowance that will have the amount of Rs 6000. This books allowance will be given on the per annum basis. Traveling allowance of the amount of Rs 5000 will be given on per year basis. Then finally initially settlement allowance shall be given only for one time and it shall have the amount of Rs 10,000. You have to submit your online application. Make sure to visit the admission site portal of HEC. Apply and submit your application form by visiting that portal. 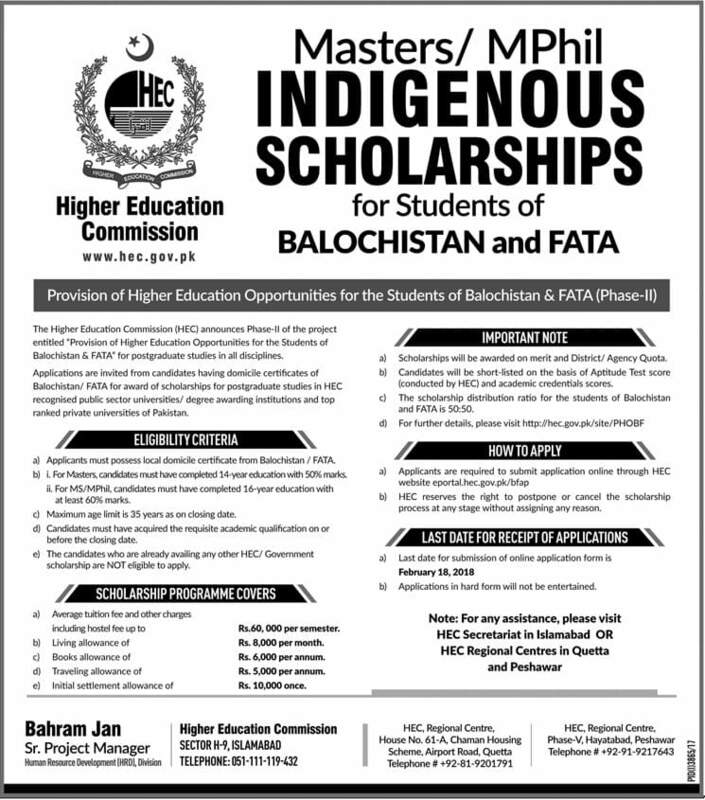 Note that HEC Higher education commission has the right to postpone and cancel this HEC scholarship program at any stage of the time. Any of the candidates will not have any objection upon the cancellation or regarding postponing this scholarship program. 18 Feb 2018 is the last date to apply. So hurry up and apply in this HEC scholarship program on the most immediate basis. If you will submit your application form by hand then it will not be accepted. For more help and for further assistance and guidance, you can visit the secretariat office of HEC which is located in Islamabad. You can even visit the regional centers of HEC Higher education commission which are located in Quetta and Peshawar.